On a recent journey home from a weekend in the peaks, the disco was loosing power up long gradients and under "harsh" acceleration. It almost felt like someone literally cut the fuel supply at certain RPM's / load on the throttle, and occasionally the car would "kangaroo" as it got power then it was cut again and so repeated itself (not nice) lol. My hunch was the engine was starting to "Over boost" and to protect the engine the ECU cuts the fuel supply if it sense's an over boost situation. I always carry my Nanocom with me when going anywhere of significant distance "just in case" , so that was promptly plugged in to see what was going on, and sure enough when "trying to the rev the engine over 2500 RPM the waste gate modulator info that Nanocom shows under "read fuelling" went to zero occasionally, so it basically was not controlling turbo charger boost / waste at certain times and was very "hit and miss" at best. 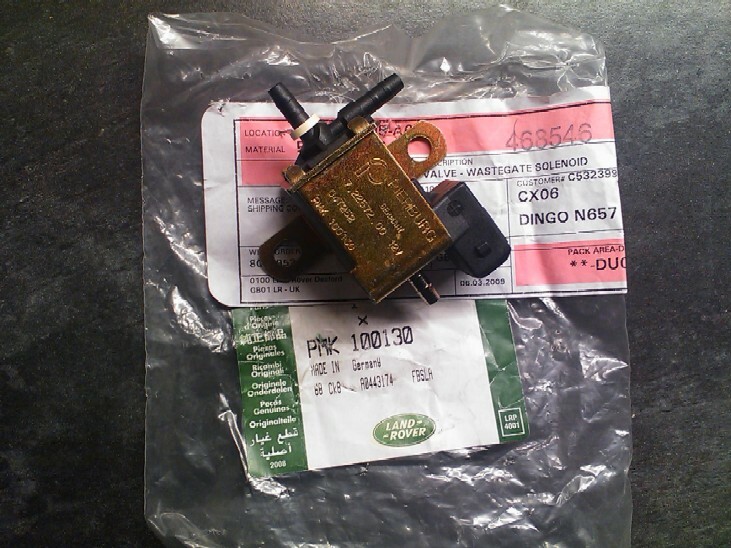 The ECU was obviously sensing this and cutting the fuel to protect the engine hence the severe lack of power, so not being able to do much at the road side I travelled home a little slower than normal and promptly ordered a new modulator asap. It has 1 electrical connection and 3 little vac tubes. The tubes run to the intercooler hose tap off under the steering reservoir (metal tube section), the waste gate itself on the turb charger and on to the flexible intake tube from the airflow meter to the turbo. To replace it is really straightforward. 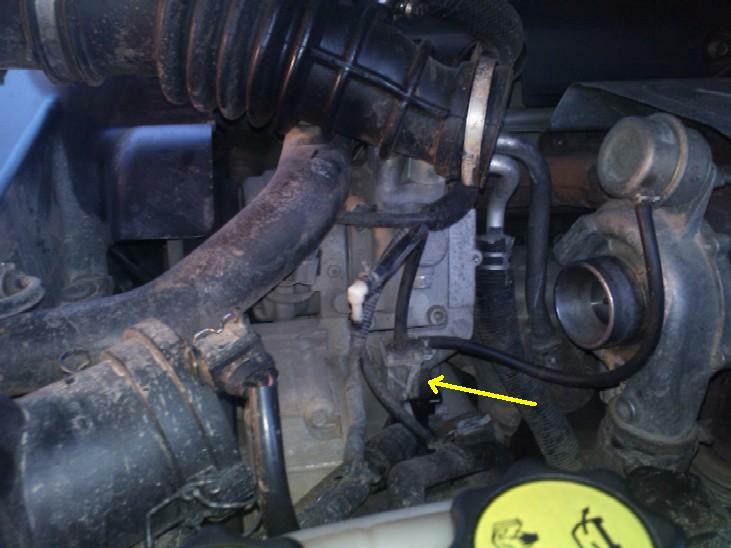 Just unclip the airflow meter from the airbox, undo the jubilee clip at the turbo end and lift the flexi tube out the way, you may have to disconnect the waste gate tube that goes onto the flexi intake pipe to aid moving out the way. Once you can see the modulator, its a case of undoing the 2 10mm bolts (don't drop em) and disconnecting the little vac tubes. Now its a pretty safe bet the tubes have been on there a while, so its a good idea to give them a gentle "twist" to free them instead of pulling on them straight away and risk splitting them. They are held by the dredged little spring clamps, but they a very small so don't pose much of a fight. You will most likely find the electrical plug is quite close to the power steering tubes, and may require you flexing the tubes out the way to remove it, it has the standard type spring clip that holds the plug on, its good time to check that it has not chaffed either the wiring to the modulator or the steering pipes below it. The rest of the refit is the reverse of the removal, make sure the flexi intake hose is connected properly and fully home on the turbo and the clamp is nice and tight. If you have access to a Nanocom or similar diagnostic tool, then take the vehicle for a run and ensure that under "Live data" the waste gate is operating correctly ref the amount of throttle you apply, if you can, take the vehicle to a long steep climb that requires a lot of load on the engine / throttle to come up the gradient, that way you can best check the modulator out, and ensure your able to rev the engine over 2500 RPM and she continues to "pull" without loosing power / the ECU cutting fuel because of an "Over boost" situation. Overall a simple cheap fix that can make the world of difference to the TD5.